A BIG crowd is expected for Sussex Sharks’ T20 Blast match with Surrey at Arundel Castle this afternoon. The match signals the start of the Sussex Cricket in the Community Arundel Festival, which also includes the County Championship match against Durham from Monday to Thursday. 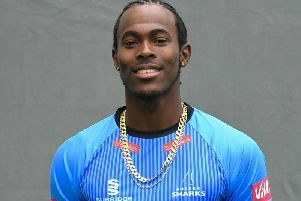 The Sharks are a point ahead of neighbours Surrey in the South Group table, and with the standings tight in terms of points; both sides will know that a win in the competition would kick-start their bids for the quarter-finals. Mahela Jayawardena is set to play his final home game for Sussex, and top-scored with a half-century infront of a packed Hove on Friday night against Essex Eagles. Skipper Luke Wright has a good record against Surrey, hitting four half-centuries against the Oval outfit. Sussex are once again without Jimmy Anyon, Lewis Hatchett and Ajmal Shahzad due to injury, along with Chris Jordan who is with England for their Royal London ODI Series with New Zealand. Surrey include former England man Kevin Pietersen amongst their ranks, for what could be his final game in this country, before he heads to the Caribbean Premier League. The match starts at 2.30pm and gates open at 12.30pm. The Sussex squad is: WAT Beer, BC Brown, C Cachopa, HZ Finch, DPMD Jayawardena, CJ Liddle, MW Machan, TS Mills, CD Nash, SA Piolet, OE Robinson, LJ Wright (c), MH Yardy.